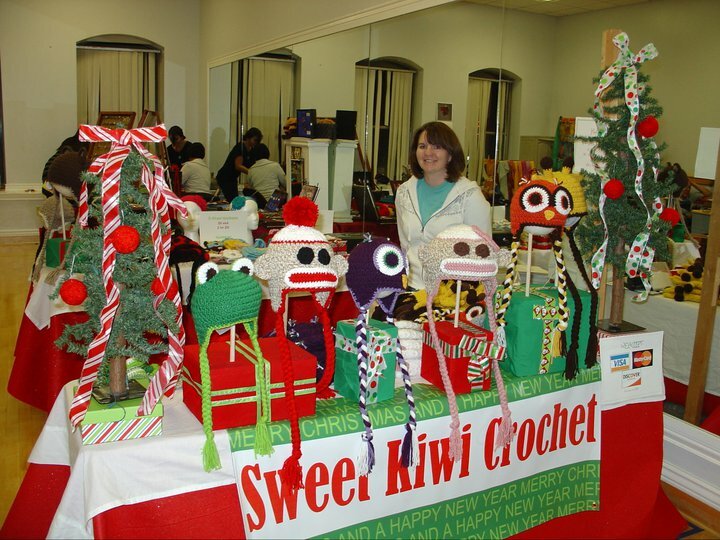 ← Changes coming to Sweet Kiwi Crochet! Selling at a Craft Show, Part 1: Where do I find a show!? I decided to time this series to help people with this years Christmas shows! You may be thinking it’s too early to be thinking about Christmas, but it’s definitely not! Most Christmas shows start the Thanksgiving weekend, and applications are starting to go out now! Wait to long and you could miss out on some great opportunities! So now the big question, how do you find these shows!? I’ve found that the most reliable way is by word of mouth. Find other people in your area that have been selling homemade goods for a while. They don’t have to do the same craft as you, in fact, I find that it’s better if they don’t! People are much more willing to give you advice and share their knowledge if you’re not competing in the same category as they are. Start with Facebook. You can simply ask in your status bar if any of your friends sell things themselves, or if they know anyone that does. Home-businesses are growing like crazy right now, so it shouldn’t take you long to get in contact with some other like-minded people. Send them a short email, or private Facebook message, introducing yourself and what you do, and asking if they would be willing to to recommend any shows in your area that they’ve had success at. This is how I got information on shows my first year, and I was never turned away. You’ll be suprised at how happy people are to help! No success on Facebook!? There are many other ways to find out about shows! Talk to your friends, check your local Craigslist listings, or google the name of your town and the words ‘Craft Show’ or ‘Craft Fair’. There are a couple other websites that can be extremely helpful as well! www.managemymarket.com is great for finding farmers markets in your area! You do have to register, but it’s free. Many farmers markets only let you apply through this site, which also makes it very convenient. www.festivals-and-shows.com is another website that has some pro’s and con’s. It seems to be better for certain areas of the country than others, so you can try it for your area and see how it works for you! http://www.alotofcraftshows.com/ has a comprehensive list of craft shows for all 50 states. $$: For those who don’t have a lot of spare cash lying around, the cost of the show can be the most important factor. You want (and probably need) to make a profit. If it’s your first show, I would not recommend spending more than $100 on a show. Always be sure that you have enough product to make a profit after your costs. Date: Make sure that you’re completely commitment free the day of the show, but also in the days leading up to the show. You also want to make sure that the show is at a good time. Weekends are always best. For Christmas, the Friday & Saturday after Thanksgivings are always GREAT days for a show. You may be requried to set up the day before the show, and you’ll need some time to prepare your exhibit, so be sure that you’re not signing up for a show during a time that you won’t be able to enjoy! This should be fun, not addition stress. Accessibility: This applies to 2 different things – The ease of getting to the show for you, and for customers and how easy it is for people to find out about the show through advertising or reputation. You don’t want to do a show too far away from home, unless you can afford the extra travel and accomodation costs. Be sure to factor these into the cost of the show before committing! You also want to take into consideration how easy or hard it was for you to find out about this show. Will other people know about it? The best show will be a complete disaster if no one knows about it, or if they can’t get to it! Other Vendors: This is something a lot of people don’t think about until it becomes a problem. For me, I’ve found that selling my hats I do MUCH better at all-handmade markets then at ones that combine handmade and imported vendors. Shows that have all handmade products can attract different customers then those who also sale imported things. I’ve also found that juried markets are better for me. If a market is juried it usually means that you send in samples of your products, or pictures of you products, and the managers choose who will get a booth. This not only means that the quality of the wares at the market is better, but also that there won’t be 10 other people selling the same product as you. So what do you think? What advice do YOU have for finding craft shows to sell at? Any success stories, or cautionary tales for others to learn from? Thank you for the tips, I enjoyed the read!